Becker CPA Review - 2019 Online Course Features - READ Before U Buy! 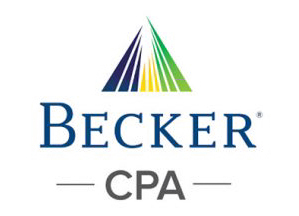 Becker CPA review has been a trusted name in the industry for quite some time, putting their review course among those ranked highest. In fact, they are the number one name in the industry. They also boast a passing rate of twice that of students without their product. Their course also includes 100 video lecture hours, but has almost 7,000 multiple choice questions paired with 300 simulations. The courses, however, are only available for up to 18 months (some for only 12), so this course is not for those who wish to take a long time to prep, or attempt the exam multiple times. The course is among the most expensive of its kind, at a whopping $3,500. Like Roger’s course, flashcards are still an additional cost at up to $180. It’s worth mentioning that this course, despite its price tag, does not offer a money back guarantee. Part of the cost is justified by the familiarity it provides with the CPA exam, with software looking almost identical. The company’s competitors, however, have almost all begun to graduate to the same format, almost eliminating this advantage. Its user friendly layout is luring, however. The notes are comprehensive and thorough, and even the fonts are appreciated by many students simply because it draws the eye to important areas rather than plain, encyclopedia style fonts. Students love that the courses are presented in concise manners that don’t overload a brain that is likely already nearing burnout. For those who learn best in physical lecture environments, this is one of the only courses on the market to offer the opportunity. It’s worth noting that some of these courses, which are taught around the world, are simply moderated classrooms with virtual instruction. If this is a main reason for your selection of this course, you can find out ahead of time if you will have access to live lectures and tutors in your particular area. If this doesn’t work for you, the Becker CPA self-study course may be best. Number one name in the industry. Lecturers may not be as “present” in some areas as others. Students are twice as likely to pass the exam with this course as without one. Most expensive, priced at $3500, with flashcards adding cost. User friendly layout with software that mimics the exam. No money back guarantee. Offers a physical lecturing environment when preferred.